As we enter into the holidays—a time of family, tradition, fine food and wine— the most spectacular of wine and traditions comes together to form a unique (and tasty!) cocktail for everyone over the age of 21 to enjoy. We all have our own traditions during the holidays. For some, it might be the perfect eggnog recipe that was passed down from Grams. For others who find eggnog disgusting, it’s probably something else …perhaps a mulled wine recipe passed down from Gramps. And if you have neither, then read on, because we have just the recipe to share with you. 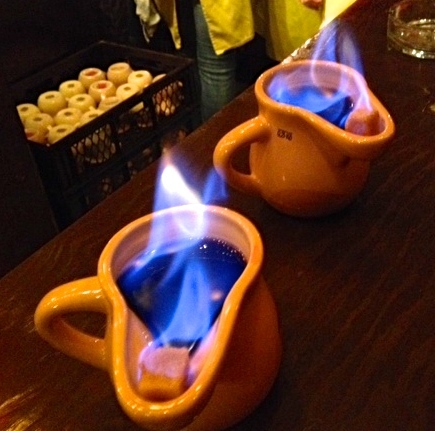 Meanwhile, whatever your tradition may be, it likely involves a holiday toast..
One of the more impressive Christmas beverage traditions that I have seen is an old German tradition called Feuerzangenbowle. Literally speaking, it is flaming mulled wine (a warm mixture of red wine, fruit and spices) that is usually made during advent or to usher in the New Year. Here is the recipe, so that you might start a new tradition! —this is important in order for the sugar to ignite! Heat the wine and fruit juice and then add the fruit slices and spices and heat for 20-30 minutes. Once done you may transfer the mixture to a hot pot punch bowl. Once you are ready, dim the lights and set the sugar on fire while occasionally stirring and pouring additional rum over the sugar to keep it flaming. When significant melting has occurred—serve and drink! At Rappahannock, we are constantly on the lookout for neat and festive wine recipes. Do you have the perfect recipe down to a science and are willing to share? Send us the recipe so we can continue to spread the Christmas cheer!